As my jet began its descent, I gazed out over the gradual terrain of Kodiak Island, Alaska. I knew this view was misleading as Kodiak yields some of the toughest hunting landscape in the world. I was on my first fly-out big game hunt, scheduled to spend up to 10 days in remote Kodiak to hunt the highly-prized Roosevelt elk on Raspberry Island. 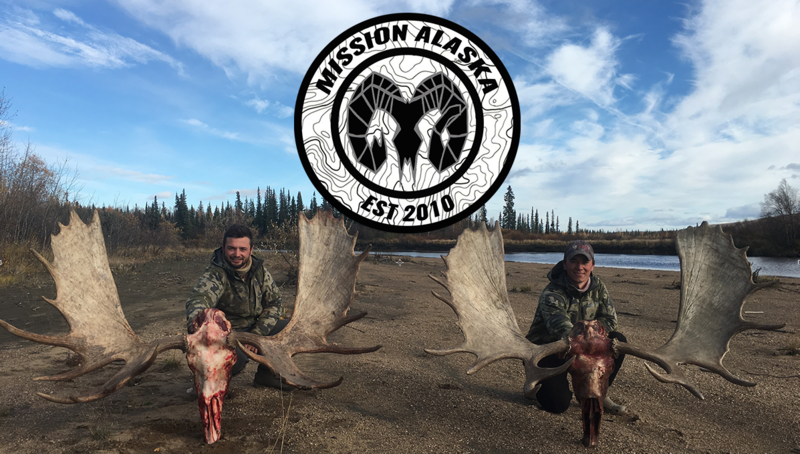 I was born and raised in Alaska, but hadn’t taken my first big game animal until I was 24 when I shot a cow moose on an archery hunt with my dad in Fairbanks, Alaska. I was instantly hooked on Alaska big game hunting and when my work as an engineer brought my family to Kodiak for a year, I took advantage of the opportunity to explore the island, hunting deer and mountain goat. I had never seen an elk in person but heard that the Roosevelt, largest of the elk family, could be as large as moose. Like much of Kodiak, there is a high density of colossal brown bears on Raspberry Island to contend with. Foul weather can blow in without notice and make hunters miserable and sometimes trapped for over a week. I was very excited for this opportunity but also nervous. I was greeted at the Kodiak airport that evening by two local friends, Doug Dorner and Ryan Burt. Doug had helped me bag my first Sitka black-tailed deer when I lived in Kodiak the year before so I knew he would be an essential asset on this hunt. Ryan also had a lot of experience in the Kodiak outdoors. I loaded my gear into Doug’s truck and we set off to the float plane docks to meet our pilot, Keller. Between the three of us we had amassed enough gear to last for weeks, but somehow managed to cram everything into the Cessna 206 barely within the load limit. It was a clear evening as we set out towards Raspberry Island, eager to spot the elk herd from the air before landing at camp. The local biologist had said there were 155 elk on Raspberry according to his last aerial survey. We had a general idea of where the elk could be on the island, but it was still a vast area to explore from the air with a heavy load and limited fuel. After scouting the north half of the island, we were beginning to get discouraged without a single elk sighting. Then, during one of the final passes, numerous light-brown spots started to pop out at us on one of the mountain-sides. The elk were congregated into a large herd, tucked away in a mountain bowl on the opposite side of the island from where we planned to set up camp at Onion Bay. View of the elk herd from the air. There are very few access points on Raspberry, even during decent weather, so we decided to stick with our original drop location and just hump it over to the other side of the island in the morning. After a smooth landing in Onion Bay, we picked out a spot at the north end of the bay to unload our gear. Keller handed the gear off one piece at a time and then bid us farewell as he lifted the plane up off the water with ease. As the plane disappeared over the horizon, there was an overwhelming silence and the realization sunk in we were now all on our own. We hauled our gear up the hill to a flat, sheltered spot to set up my Cabela’s Alaska Guide 6-man tent. An electric bear fence was set up around our tent as an added measure of comfort, but I was skeptical that it would actually work. We finished setting up camp at dark and then Doug cooked us up a hearty shrimp dinner. Our game plan was to wake up early that morning and set off up the mountain in the dark to reach the elk herd before they moved. Ryan celebrates as our plane departs. To reach the elk, we needed to climb up one mountain and down the other side, cross the valley, and climb up the next mountain to the bowl on the backside. We set out that morning an hour before sunrise in a windy drizzle. What had appeared to be a relatively easy 3 to 4 mile hike from the air, turned out to be nearly impenetrable alders and terrain. There was no clear path up the first mountain as we fought our way through alders and salmonberry thickets. When we reached the top of the first mountain at dawn, we were relieved to find a mossy game trail through towering spruce trees. The relief was short-lived when we began descending the backside of this mountain and were again pushing through thickets until we reached the valley. The valley at the center of the island was a break from the alders but also had its own obstacles. We took a detour around the lake and network of creeks through the dense, dark forest and across beaver dams and marsh. Along the way we saw massive fresh bear tracks and a few deer. Ryan ascending the second mountain. After meandering across the valley, we ascended the second mountain as the wind-driven rain picked up. I spotted a large brown bear about 1000 yards away which didn’t pay much attention to us. We hoped the nasty weather would keep the elk hunkered down near where we had spotted them the night before. From what I learned about elk, they are always on the move and will cover a large distance in a short amount of time even without any hunting pressure. Large brown bear on hillside. I started to reach the top of the saddle and immediately froze and dropped to ground as I began to spot elk at a distance. I motioned for Doug and Ryan to get down and pointed to where I had seen the elk. Eric hunkered down after spotting elk. We slipped further up the mountain to a decent vantage point. The entire herd was on the backside of the mountain on the side of the bowl about 1000 yards away. I decided there would be too many eyes on me to stalk right at the herd, so we climbed higher up along the backside of the ridge line so I could descend on the elk with cover. I left my pack with Doug and Ryan at the top of the ridge and then began my descent towards the elk. “Yeah maybe,” I said, trying to convince myself I could settle for just a spike bull. The ridgeline above the bowl provided essential cover and the wind was in my favor. I skirted along the ridge, pausing periodically at covered vantage points to examine the herd and plan my stalk. The large herd appeared to consist of two large alphas bulls, each surrounded by tight smaller herds. The rest of the elk were widely scattered around these herds. I could continue along the ridgeline within range of the upper herd, but it would be a longer stalk and there was too much uncertainty in the wind direction. I decided to pursue the lower herd since there was excellent cover through a spruce thicket which could allow me to stalk right within range. Partial view of elk herd from vantage point. As I crept through the spruce trees, my legs began cramping and the wind started changing direction. The strenuous hike from camp was finally catching up to me. The spruce trees were thicker than I anticipated, and I had to crawl under and around branches and wedge myself through trees for a few hundred yards. During my stalk I caught glances of the upper herd higher up in the bowl, which were starting to stand up and appeared spooked as they looked in my direction. As I moved further into the thicket, I appeared to hit a dead end at an impassible wall of thick brush. I debated turning around and trying a different stalk, but I knew I didn’t have much time before the entire herd fled. I just continued pushing through the dense thicket hoping the wind would mask the noise. At this point, I told myself I would just shoot the first bull I saw within range. Just when I began to give up hope of getting through unnoticed, I started seeing light through the trees and realized I was at the edge of the thicket. I peered through one of the small openings and gasped as I saw a cow elk standing and looking right at me only 40 yards away. I immediately froze and waited for her to look away. As I edged closer, crawling under a branch to get a better view, I spotted a bull lying behind her. It was the huge alpha bull lying down only 45 yards away! I perched my Remington .300 Winchester Magnum onto a branch and located the elk in my scope through a small break in the trees. The cow was directly blocking a shot at the bull. For nearly 10 minutes, which felt like hours, I watched the cow through my scope staring at me while I tried to fight off leg cramps and excitement to remain still. Finally the cow elk lay back down and allowed a perfect shot at the bull’s massive neck. Without hesitation I immediately fired a round and lost site of the bull as numerous elk fled past me as the shot rang. When the chaos cleared, I could see the alpha still laying on the ground where I shot it, but trying with all his strength to get u p to his feet and join his herd. I waited calmly with the bull in my sights to make sure he didn’t get up. I followed up with another shot in the neck and then crawled out of the thicket toward the bull. The bull lifted its head as I approached, so I fired once more behind the ears to finish him off. The elk herd flees after hearing the shot. I was shocked to see just how massive the animal was. He was the size of a large horse and appeared prehistoric in nature as I approached. The wide, thick antlers had magnificent white points. It had at least two broken points and there were distinct battle scars on its neck. The elk were still in the middle of rut and this bull was quite the fighter. Eric proudly poses with his first elk kill. Doug and Ryan moved down the mountain toward me with the gear. Doug reached me first and said sarcastically, “What’d you do that for! ?” as he saw the huge elk lying beside me. We stood around in awe of the elk and took pictures, but our joy was dampened at the realization of the dreaded pack back to camp. This one-way trip to the elk herd was 3.5 miles from camp and had taken over 4 hours! Since it was already noon, we would surely be heading back in the dark. Doug and Ryan pose with the elk. From stories I’ve heard, the brown bears can move in on an elk kill in less than an hour and will likely reach the gut pile by the first evening. Our primary goal was to get the meat away from the gut pile as quickly as possible. Ryan and I butchered the massive animal, constantly looking over our shoulder, while Doug hauled the quarters to a large spruce tree 400 yards away. After carrying the final load over to the spruce tree, Doug climbed the tree with a rope and we hoisted the meat bags up into the tree and tied them off about 15 feet up in the air. We finally set out around 6 pm with loaded packs while darkness was setting in. On our descent toward the valley we spotted a large sow with cubs near where the boar was earlier that afternoon. We staggered back toward camp under the glow of our headlamps. I felt like there were eyes on us at all times as we moved through the pitch darkness. Ryan had lost his headlamp that morning so he tried to follow close behind me. There was no apparent path back to camp and we inevitably wound up fighting through alder patches whichever way we went. In an attempt to cut through the alders, I led us along a small creek up the backside of the mountain but the plan quickly backfired as alders around the creek became denser and towered above us. We crawled on through as I seemed to catch my rifle and frame pack on every branch. I was past the point of exhaustion as we made the endless descent towards Onion Bay. After finally collapsing into camp at around eleven, we prepared a spot for the meat by clearing an area of tall grass then placed the meat on alder branches, and set up a bear fence around the meat. Unfortunately, there weren’t any trees near camp sturdy enough to hang the meat from. View of valley at sunset. That night I awoke to a bear snorting right outside our tent. I instinctively grabbed the .44 Magnum pistol and yelled, “Bear!” Doug cautiously went outside and I followed with a flashlight and gun in hand. The bear had disappeared and the meat appeared undisturbed so we went back to sleep. We slept in that morning and took our time getting ready as my body ached and I was dreading the hike back. It was a beautiful sunny day and we took advantage by drying out our gear from the day before. When someone finally looked at the time, we were alarmed to realize it was already past noon. With 4 hours each way to the meat tree, we were doomed to hike back in the dark again! Doug sets off with loaded pack. We were starting to learn better routes through the dense landscape but still seemed to always wind up in impenetrable alder patches. Doug led the way while Ryan and I lagged behind. When we finally ascended the second mountain we stopped and glassed the gut pile from a distance. The eagles were on the gut pile but there didn’t appear to be any bear activity. We lowered some meat from the tree and carried out the heaviest load that day. Our bodies were thoroughly exhausted and I was praying that someone wouldn’t get hurt. Doug almost fell into a pond as he was leading the way across an unstable beaver dam. With every step, my legs were on the verge of giving out under the heavy load, and I tried to stop nearly every few hundred yards to rest. I was impressed with Doug’s ability to continue pushing on and also motivate Ryan and me to keep moving. On our final descent down to Onion Bay in the dark, I incredibly stumbled across Ryan’s lost headlamp and then his thermos later on in a devil’s club patch. We let down our guard that night to drink a few beers and celebrate a successful hunt and one final load of meat. We awoke that morning to rain, snow and wind. We set out on our last trip to retrieve the final load including a hind quarter, cape, and antlers. Our route was starting to get easier as we learned which ways not to go, but our aching bodies were wearing on us. Once we reached the mountain on the other side of the valley, we glassed the gut pile. Again there wasn’t much sign of bear activity. When we approached the tree this time we noticed something was different. The hind quarter was completely missing from the tree! Only the cape and the antlers remained in the tree untouched. We frantically searched around the tree and then it dawned on us what had happened. There were large claw marks going up the side of the tree. A brown bear had climbed the tree and grabbed the quarter, rope and all. It is uncommon for brown bears to climb trees, but this wise bear seemed to know exactly what he was doing. Bitter and disappointed, we set off to camp with our light loads. We were anxious to get back as quickly as possible to ensure our remaining meat was safe. We got back around 5 pm and found our meat pile undisturbed at camp. Now that the bears have tasted the meat, we decided it would be best to get off the island that evening if at all possible. I called our pilot on the satellite phone and told him what had happened. “Are you ready right now?” he said. Keller had been scheduled to pick up another hunting party that evening but they still weren’t ready. “We can be!” I said. We had to hustle to pack up camp before the pilot arrived. Keller helped us carry our gear down to the beach and loaded up the plane. Two trips later in the Cessna 206, we had everything back to the float plane dock in Kodiak. We conquered a 10 day elk hunt in only 3 days and it was by far my most strenuous accomplishment. There is no time to rest on a hunt like this since after an elk is down, the clock starts ticking, and there is an urgency and obligation to secure the meat from the bears as quickly as possible. I found out later the most massive elk by weight are known to come from Raspberry Island. Even after losing an entire hind quarter to the bear we still ended up with 300 plus pounds of dressed, bone-out meat! After returning home, our pilot informed me that other hunting parties had lost nearly whole elk to bears that week so we were lucky we got out as much as we did. As I admire the huge elk mount on my wall, I reminisce the grueling 3 days in alder hell and bear haven, and I’d do it all over again given the opportunity. My advice to someone planning an elk hunt on Raspberry: Be prepared for bears and get in shape! Taxidermy credit to J. Lewis Hershey.